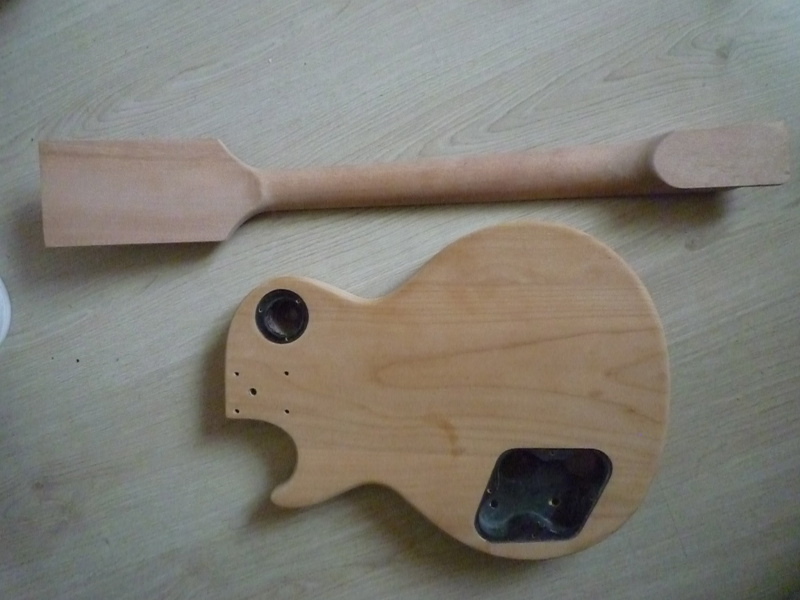 I bought the neck less than 60€ on a chinese site, shipping included. I thought it wasn’t worth to pay 200€ in a Warmoth neck for a guitar bought half the cost. I wasn’t very confident about my guitar building skills either, I worked on some guitars before but not up to this point. 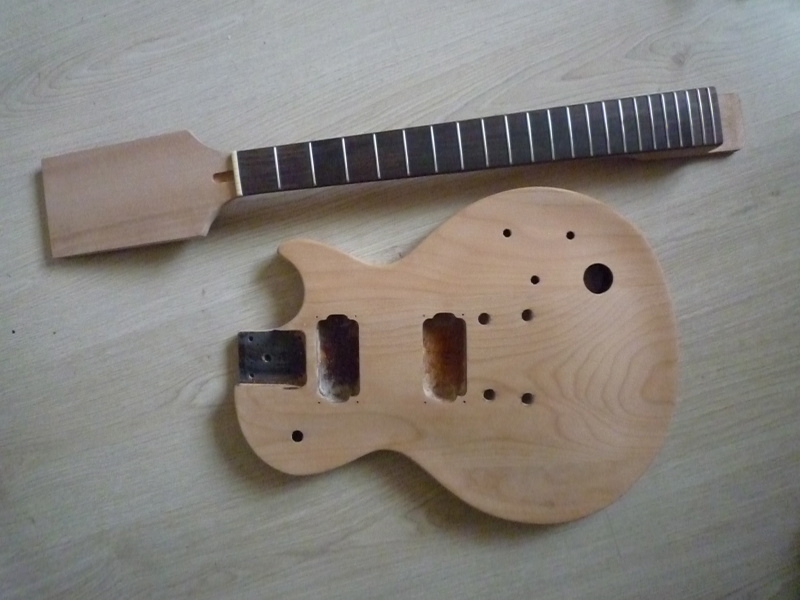 Before buying, I sent a message to the seller to get confirmation of the announced wood (mahogany), the radius (12″), the width at the end of the fretboard and most importantly the scale length (24.75″) that had to be identical to the old neck. The neck came well packed and looked really close to the photos of the site, so I wonder if it’s not the same one… Prior to receiving it I kept my fingers crossed because the grain of the wood on the photos suggested a quarter sawn wood (or the good part of a flat sawn wood), so a much more stable neck. So many species fall into the mahogany category, I had no idea about the density of the wood. So having a quarter sawn neck is comforting. I was lucky on this one. There are unknowns though, I have no idea about the trussrod quality or the way it was mounted. 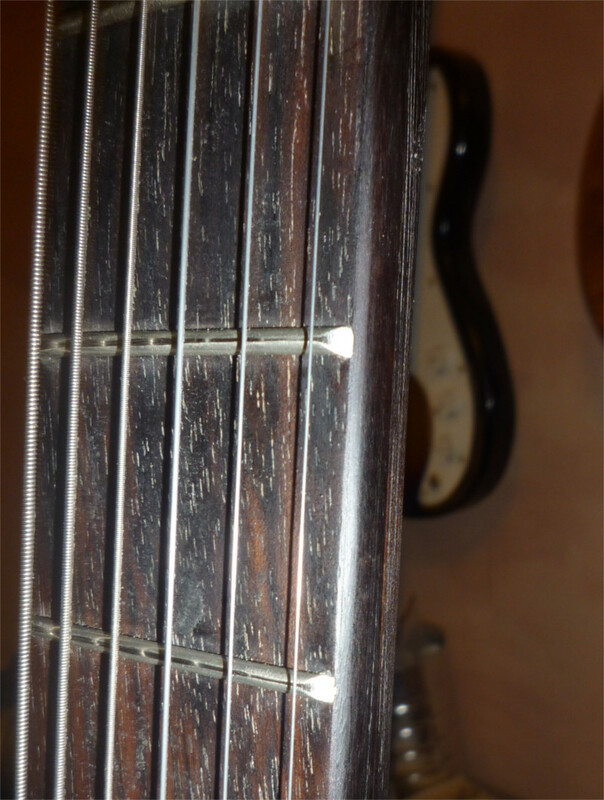 There are also some drawbacks : most of the frets had rough edges, they were not leveled and, more critical, they were way too much beveled on the sides, the playable width of the neck is consequently shorter. I had to put a bridge with an adjustable space between the strings so I could gain 1 or 2mm, but it doesn’t prevent the high E string to slip if I press too hard… So I already bought new frets and I won’t wait 2 years to put them on. 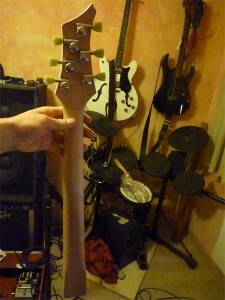 The neck doesn’t move from the body when I lift the guitar (there are no attachment screws behind). 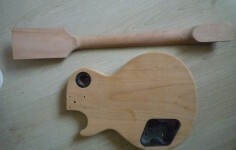 The fit wasn’t that tight after burning the guitar, the wood has slightly shrunk. 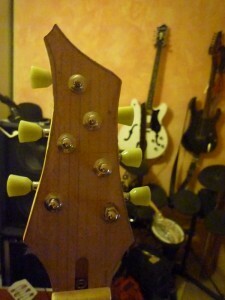 One of the advantages of buying a raw neck is to shape the profile as you like. 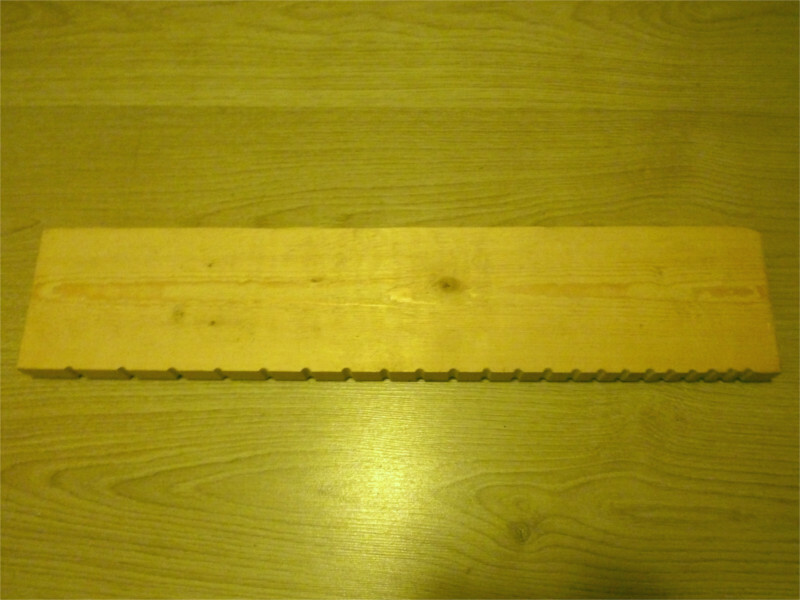 I started to plane it in a symetrical way until the thickness was good for me. And while trying to “play” as if there were strings I felt the wrong spots to work on. After several back and forth I found a profile I was satisfied with, it’s slightly assymetrical with the side of the lighter string a little thinner. The neck is still pretty beefy, I was never comfortable with thin necks. Take your time for this step to come up with a really comfortable profile that suits you and work on the whole length of the neck to get an even surface. After I finished filing, I sanded with different grits and it was done. I know you don’t see much on the photo, I took it by night and I used a crappy camera. I hope you’ll find the upcoming photos from Part 3 more explicit. 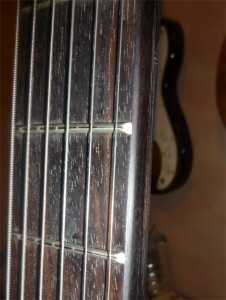 Once the guitar was finished I leveled the frets. To make sure the neck was straight I made a little tool with a pine board (straight) where I filed the frets locations. I was able to set the trussrod right to do the job properly. If professionnal guitar builders watch this, I’m sure they laugh at me (photographers too). I then glued some sandpaper on a long aluminium block (straight too) and I could level the frets by sanding all along the neck. Once leveled I ended with finer grits. After measuring where the tuner holes would be, I drew the shape of the headstock directly on the wood. 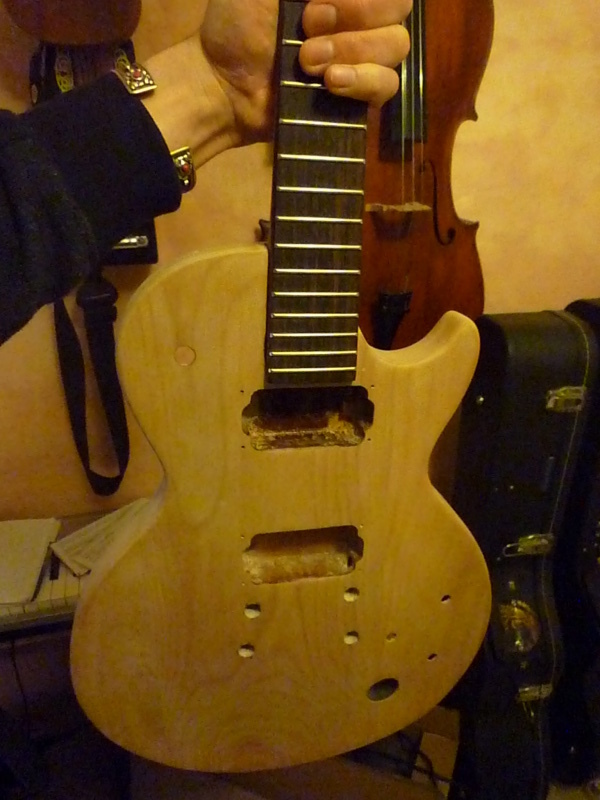 I then cut roughly around with a jigsaw and drilled the tuner holes. In my measurements I added the width of each string to be sure the strings would go perfectly straight after the nut, I was very precise. My drilling ability however was far less precise… When putting the strings at the end of the build I realized the G string tuner was a little too close from the D one. I’ll solve that problem later. 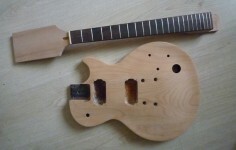 Now I just have to file and sand the headstock to its final shape before everything goes under the blowtorch.